Nurturing a love for reading begins with providing reasons for reading and getting students excited about books. As a classroom teacher, nurturing a love of reading in my students was almost an obsession. This continued when I had a child. Here are twelve ways to nurture a love of reading in kids. 1. Reflect on reading. We will only do things that we enjoy doing or feel are worth it. When kids have a positive reading experience -- one in which they learned something or felt deeply engrossed in a story -- guide them to name those positive experiences. They need to think and talk about the experience, to mentally register the positive impact, as this may motivate them to repeat the activity. 2. Listen to audiobooks. There are so many benefits we can glean from listening to audiobooks. We can set aside the mechanical skills we need to read and just focus on plot, characters, and accents; we can lose ourselves in a story. For struggling readers, this is a treat. This is one way to give them occasional access to age-appropriate texts and to get them hooked into reading. 3. Identify reasons for reading. We aren't going to do something we don't see a purpose for doing. The more we can engage kids in thinking about why they're doing something, the more chances we have of increasing their investment. When I taught middle school, at the beginning of the school year, I always did an activity called, "Why Read?" I asked students to generate as many reasons as they could think of for why we should read. It was fun. I challenged each class to come up with more reasons than the other classes (a light, competitive element generated sixth-grade energies). We kept these up on the wall all year. 5. Learn about what boys need. My approach to teaching reading in middle school changed radically after I read, Reading Don't Fix No Chevys: Literacy in the Lives of Young Men by Michael Smith and Jeffrey Wilhelm. As I implemented ideas based on this book, I saw my male students' interest and appreciation for reading skyrocket. I've applied these same ideas while raising my son. Essentially, it's offering them lots of nonfiction and texts that have practical application -- and it has worked for my son, too. 6. Read educational graphic novels. Offer kids a variety of genres, including educational graphic novels. Two very popular and exceptionally well-written graphic novels are: Resistance, a three-part graphic novel about the French resistance to the Nazis, and Boxers and Saints by Gene Luen Yang, a three-part graphic novel about the Boxer Rebellion. My son has read each of these several times. 7. Read books over and over. Many young children love hearing the same book over and over. Continue this practice as kids get older. Give older kids permission to read books again and again. Ask them what they're experiencing as they reread books: What new insights do they get from the story? How do they see things differently? What did they appreciate this time? 8. Ask kids for their opinion. Ask kids how you think you could nurture their love of reading. Engage them in this process as an active participant. Ask them what gets them excited about reading, what makes them love it. The next suggestion was my 12-year-old son's suggestion when I asked him for his opinion. 9. Talk about the story. During the story, stop and talk with kids about what's happening. Talk about the characters. Ask them to make predictions. Ask them to make connections. 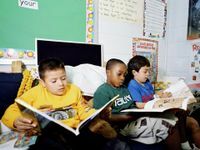 These are all basic reading comprehension strategies, but they are also strategies to get kids more deeply engaged in the reading. 10. Teach kids how to read. When I began teaching sixth grade, I undertook a three-year action research project about how I could nurture a love of reading in my students. One of the unexpected findings I arrived at was that I needed to make sure I was explicitly teaching my students how to read. Appreciating narratives, words, character development, or whatever we learned from nonfiction texts wasn't enough. My kids wouldn't love doing something that was really hard. I had to make sure I knew their reading levels and that I helped them fill the gaps in their reading skills. 11. Model being a reader. Teachers and parents: read in front of your kids. Talk about reading. Talk about why you read. Make connections between your life and the world and things you've read. Model how reading enriches your life -- maybe through your ability to read recipes, or to assemble a piece of furniture, or to research a question on the internet. 12. Take fieldtrips related to reading. Go to the library for a field trip, (or go on the weekends, parents). Go to a bookstore just to hang out and browse the books. Walk around and talk to kids about what you're seeing in the library or bookstore. What calls your attention? Which titles? Which book covers? Ask them what they notice. Read the backs of books. Get excited. Flip through books. Wander into a section you'd never go to. Send kids on a treasure hunt: find a book about stamp collecting, find a book about ancient Rome, find a memoir by someone with whom you have something in common. What has worked for you to nurture a love of reading in your students or children? Please share in the comments section below.